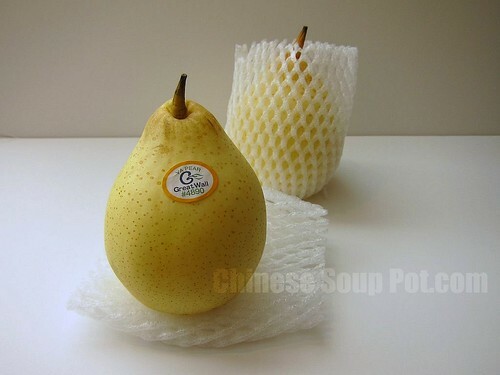 Ya Li is a specific type of pear imported from China, and are in season during the autumn and winter months. They have a very sweet, juicy, white, and crisp flesh, with a smooth light-yellow skin on the outside. Well known for its scrumptious flavor and crisp texture, Ya Li pears are a very popular pear in China, Korea, and Japan. They are eaten as a fruit, or used in making Chinese soups and dessert soups. Ya Li pears are a good source of vitamin C and fiber. They contain high levels of beneficial pectin and boron. Studies have shown that pectin inhibits certain cancers, while boron promotes the stimulation of electrical activity in the brain. Boron also helps in the prevention of osteoporosis by aiding the body to retain calcium. Ya Li pears are also known in Chinese medicine to be cool in nature. It clears heat and dryness by promoting body fluid secretion. They are also known to expel phlegm. See a list of soup recipes using ya li pears. Wash thoroughly before eating or cooking. If used in cooking, remove and discard the core. The skin can be left on for additional fiber. How do you enjoy your Ya Li Pears? Leave a comment below to share your ideas.